First edition of the Thompson’s only published novel. Octavo, original black half cloth, cartographic endpapers. Signed by Hunter S. Thompson on the half-title page. Fine in a fine dust jacket. Jacket design by Janet Perr. 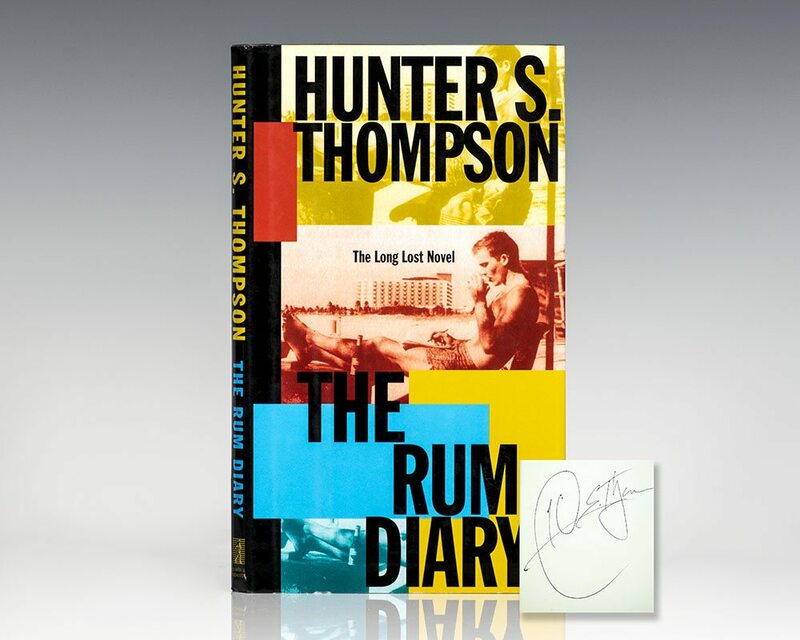 The manuscript of The Rum Diary, begun in 1959, was later discovered amongst Thompson's papers by Johnny Depp. The story involves a journalist named Paul Kemp who, in the 1950s, moves from New York to work for a major newspaper, The Daily News, in San Juan, Puerto Rico. It was later adapted to film, directed by Bruce Robinson and starring Johnny Depp. Thompson, Hunter S., Edited by Douglas Brinkley; Foreword by David Halberstam. Fear and Loathing in America: The Brutal Odyssey of an Outlaw Journalist Gonzo Letters, Volume II. New York: Simon & Schuster, 2000. First edition of this collection of of letters Hunter S. Thompson. Octavo, original boards. Fine in a near fine dust jacket with light shelf wear. Signed by both Hunter Thompson on the half-title page and David Halberstam on the title page, who contributed the foreword to this volume. Thompson, Hunter S.; Illustrations by Ralph Steadman. Fear and Loathing in Las Vegas: A Savage Journey to the Heart of the American Dream. New York: Random House, 1971. First edition of Thompson’s second book. Octavo, original half cloth. Boldly signed by Hunter S. Thompson and Ralph Steadman on the half-title page. Near fine in a near fine dust jacket. Illustrations by Ralph Steadman. An exceptional example. Thompson, Hunter S; Peter Matthiessen. New York: Modern Library, 1999. First edition. Octavo, original cloth. Signed by Hunter S. Thompson on the half title page. From the library of Peter Matthiessen, with some underlining in pencil in Matthiessen’s hand. Very good in a very good dust jacket.